While it didn't snow today, we had lots of rain. It was the kind of day that begged the soothing comfort that comes with a steaming pot of soup and a loaf of slow rising, aromatic bread. I had no intention of stepping outside for a grocery run, so both had to crafted from pantry and refrigerator stores and that left me with few options. A basic bread was no problem, but I wanted the soup to show a little thought and care. While rifling through my files, I came on this one from our days in Chicago. The music was resurrected from that period as well. Back then, my young and earnest rhythm section kept the beat with wooden spoons and the sight of their dancing backfields would make even a curmudgeon smile. Their "Ah, ha!" was worthy of a Grammy. The simplicity of this soup and the ease with which it can made make it very appealing on a damp and chilly day. It's similar to a broccoli and cheese soup but much easier to make. You can have this one on the table in less than an hour. I have one caution to share with you. Make sure the soup doesn't boil after cheese has been added to the base. It will break and separate and you'll end up with a curdled mess. While that won't affect flavor, a once pretty soup will become downright unappealing. Whole milk can be used to replace light cream, but don't be tempted to use lower fat dairy products. They just won't work here. This is a thin soup that is lightly thickened by mashing some of the potatoes in the pot. If you prefer a thicker soup, instant mashed potatoes or a slurry can be used to fortify the base. 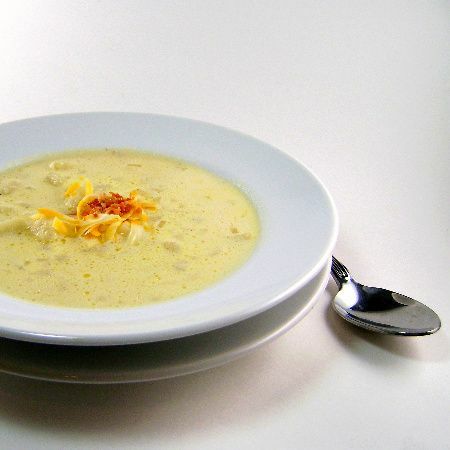 Without further ado, here's the recipe for my rainy day cheese soup. 1) Saute celery and onions with butter in a 3-quart saucepan until onions are translucent. Do not let onions brown. 2) Add chicken broth and potatoes and cook over medium low heat until potatoes are tender. about 10 to 15 minutes. 3) Mash potatoes lightly, leaving most of them in chunks. Reduce heat and stir in half-and-half. Add cheese and stir until completely melted and dissolved into mixture. Sprinkle sugar, pepper, and salt to taste into soup, stir. 4) Simmer slowly for 20 – 30 minutes taking care not to let soup scorch. When ready to serve garnish as desired. Yield: 6 servings.